We have analog RCA input and output. In addition there is also S/PDIF and Toslink for input and output. There were no obvious way to change inputs and I spent good bit of time searching and googling but could find nothing. There is no manual either that I could find. Finally I saw the teardown pictures of another model and noticed that one had a label inside the case on how to change the input with jumpers. I opened this unit but there were no such labels in it but I did find the same jumper. It would select between Toslink and S/PDIF. I could not get the Toslink to work in either setting but that turned out to be a broken Toslink input (the unit was purchased used and has been loaned out for competition). I select S/PDIF and that worked and that is how I conducted my tests. The heart of the unit is the Spartan FPGA in the middle. FPGAs are a very good fit for large number of parallel operations which is what we have in audio signal processing. To the top left there is an Arm M Cortex microprocessor for general housekeeping and communication with the host. Top right is a switching power supply which should allow the unit to run on wide range of voltages. A cirrus 4270 handles ADC and DAC functionality. Bur-brown (TI) silicon handles S/PDIF and Toslink functionality. A set of beefy diodes protect the input RCA jacks against static electricity and voltage surges which is nice to see. The output voltage is healthy at 2.4 volts which comes in handy in automotive applications to provide better noise immunity. The distortion+noise ratings though are disappointing by our standards. SINAD of 83 dB is way short of 95 dB that Cirrus Logic advertises for the CS4290 "codec" chip. For automotive applications this is probably fine but the same hardware is sold for other applications and there, one would like to have the full capabilities of the CS4290. This is almost identical to using digital input! In other words, the ADC is transparent with respect to how low the performance of the DAC is. 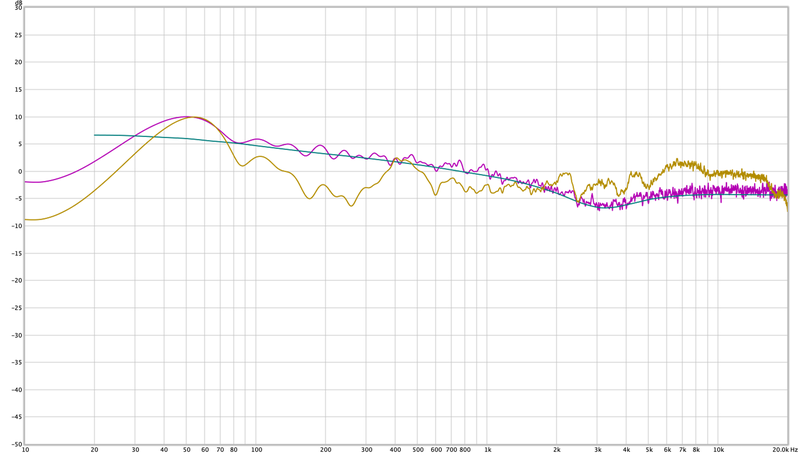 So we fall short again when using the digital input to the tune of 6 dB. Analog input (on the right) shows 3.5 dB of penalty which is reasonable. 48 kHz sampling naturally limits the response to half that at 24 kHz. Response is down -1.16 dB at 20 kHz but you can compensate for that using the DSP I am sure. We see that distortion rises at -18 dB or so. I dialed down the level in the dashboard and indeed SINAD improved by a few dBs as shown in the original graph. The 50 Khz twin tones are surely contributing to much worse performance as they are taller than the distortion products! I wonder if they are the switching frequency of the dc to dc converter. I don't think I have ever seen such a distorted square wave in all the times I have run this test. I wonder what is going on. So essentially the same showing the issue is in the DAC, not ADC. The reason I say it is truncating is due to zigzag positive and negative error depending on input level. For a company that is in signal processing business, I thought the performance would be better than what we have. Low-end consumer DAC chip limits performance by itself, there was no reason to add to it on top of that. Things like lack of dither/conversion to 16 bits is unfortunate to see. For the use the owner will get out of it, the APL1 is fine but the cost new is too high in my opinion. Charging so much for the software in consumer applications doesn't make sense to me either. At least give me rudimentary capability to program the filters for free. Overall, while I was excited to see an automotive DSP which I may deploy myself, I am turned off by the performance and pricing. Needless to say, I can't recommend the APL1. while I was excited to see an automotive DSP which I may deploy myself, I am turned off by the performance and pricing. Maybe the Dayton DSP-408? I wouldn't expect Tier 1 DAC performance, but Dayton's engineering is usually pretty solid, and the $150 price is right. That's more to my liking although it doesn't have digital input. Full disclosure: I've been fairly active in the APL community helping people figure out how to use these. The founder of APL(Raimonds Skurals) is Latvian and his english is VERY rough, so I'm happy to help when I can. The only benefit I've received from this is a free piece of software(for hardware I don't own) to demo. I’m disappointed by the measurements, but happy with the tuning results I get with it, so the measurements don't really bother me too much. I'll still probably buy a trio of APL1012's for the fully active 5.2 home system I'm building. The hardware was originally designed for the pro audio world, that is why the software and hardware are two separate purchases. In that world you may have dozens of unit bouncing around the country at any given time, but only a few actual techs running shows, so you only need a few software installs. It makes sense for the pro audio world, but has been an issue in the consumer world. The other issue with the software is that it has a steep learning curve. Again, it was designed for the pro world, where simple and pretty user interfaces aren’t needed, or expected. This has also been an issue with consumers, and after reading Amir’s MiniDSP review, I’m not surprised he didn’t wish to test the tuning functions. I work in the pro video (LED) world and software like this is just a daily part of life, it took me no time to figure it out. These measurements are taken from APL Workshop and imported into REW. The unit I originally purchased a few years ago is in the dash of my Miata. The signal chain is: iPhone —> Lightning to HDMI dongle —> Kanex HDMI Audio de-embedder —> Toslink to APL1 —> Toslink to JL Audio VX800/8i —> Analog Out —> Analog into JL VX800/8i —> Speakers. The JL amp powers the whole system and does volume control. I loop out of the amp and back into it so I can use the extra bank of PEQ’s on the line out channels. Overall it works well and is very reliable. Here is the REW tuning file for the Miata: http://lumbermansvo.com/APL/Miata/MiataSPL.mdat I made some mistakes while tuning that it’d like to correct, mainly better level matching between the subs/mids/tweets before doing the second round of PEQ. Well, you already have my address . I have this Gladen amp+DSP in my car and can highly recommend it! I had Audison first, but it was crap in many ways. This is more expensive, but really worth it. Am I the only one who took a glance at the PCB and braced themselves before any of the graphs appeared?